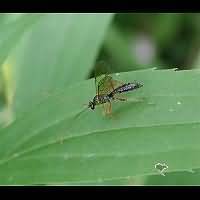 Dyspetes luteomarginatus is a medium sized parasitic wasp. Females measure 7 to 10 mm, males 8 to 11 mm. The females have a very short, hardly visible ovipositor. The insect is black, except for the legs, which are reddish brown or yellowish brown. The antennae of the males are dark brown to black. Those of the females are much lighter, usually reddish or yellowish. Dyspetes arrogator is a real look-a-like, but slightly smaller. Yet the two species are quite easily told apart, for Dyspetes arrogator is on the wing in May and June. Dyspetes luteomarginatus starts flying about in July and the adults are seen in August and the beginning of September as well. Dyspetes luteomarginatus lays her eggs on the larvae of various saw flies, Tenthredo and Tenthredopsis species mainly. From Britain Arge rustica is also reported being a host. It prefers grassy woodlands. Present all over Europe, and in parts of the Middle East And Asia.